Chicago is a sister city to Paris, which means that you don't have to trek to the City of Lights for romance if you're planning a memorable Valentine's Day this year. While you may need to snuggle up in the Windy City with a significant other to stave off the winter cold in February, there are plenty of festive events and celebrations to warm you up all month long. From annual Black History Month celebrations at the DuSable Museum of African-American History and the Museum of Science and Industry to Chicago Restaurant and Theatre Weeks at area venues, there's plenty to enjoy in Chicago this Febraury—just make sure you pack some warm clothes and check the weather before you go. Chicago's weather in February is quite chilly, especially with blustering winds and up to eight inches of snowfall over the month. Windspeeds range from five to 21 miles per hour, on average, throughout the month, making it feel up to 10 degrees cooler outdoors than it is. This, combined with only three hours of sunshine per day, makes the weather particularly dreary and bitter during this month, but with the right clothing and travel itinerary, you're sure to find a way to stay warm in style this February. The weather in February can get downright cold, so you should pack layers of clothing ranging from thermal undershirts to thick outer sweaters and heavy winter coats. You'll also want to bring snow-appropriate footwear and outwear as well as gloves and a warm hat if you plan on traveling outside. During your visit, you can check out some of the many shopping malls for additional apparel, including comfortable boots if you plan to walk a lot. Since February is Black History Month and Chicago's history is rich in African-American heritage, there are plenty of opportunities to celebrate their culture and traditions across the city this month. From tours of Black Chicago to events at the DuSable Museum of African-American History, you'll find an abundance of cultural celebrations throughout Chicago and its suburbs. Additionally, Chicago Restaurant Week, Chicago Theatre Week, the Chicago Auto Show, and the Chinese New Year Parade all take place this month. Chicago Restaurant Week: From late January into early February, you can enjoy deals at over 400 restaurants in The Windy City as part of this annual celebration. Chicago Theater Week: Running from early to mid-February, this 10-day event allows theatergoers the opportunity to see more than 100 productions for discounted prices. Chicago Auto Show: Taking place at Chicago's McCormick Place convention complex in mid-February, this annual event is the nation's longest-running auto show and the largest in North America. Chinese New Year Parade: The Chinese New Year typically falls in early February and the Lunar New Year parade usually takes place a few days later in Chicago's Chinatown neighborhood. Black History Month: The DuSable Museum and various other venues across the city will host a series of events, showcases, and exhibits in honor of this annual celebration of African American history and cultural heritage. 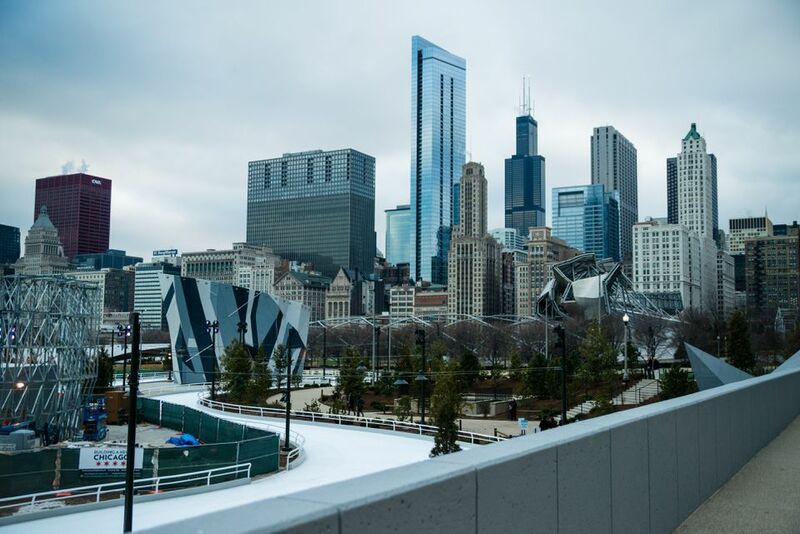 Ice Skating: Various parks across Chicago, including Millennium Park, will host indoor and outdoor rinks throughout February—most stay open through mid-March. Since Chicago's winter is particularly brutal this month, guest can typically enjoy lower rates at revered hotel properties like the Chicago Athletic Association Hotel, Soho House and Thompson Chicago. Chicago Restaurant Week offers prix-fixe deals on more than 300 dining destinations while Theatre Week offers discounted admission to some of the best shows in the city. There is a chance of flight/travel problems if a snowstorm comes through, but there are some good places to dine and drink if you get stranded at Midway or O'Hare airports. In addition to snow, extremely cold temperatures are expected throughout the month, so you make sure you cover as much skin from the elements as possible, especially if you're outdoors after dark. Chicago Athletic Association Hotel: In its new life in the property that originally opened in 1890 as an exclusive men's club, CAAH operates as a lifestyle hotel catering to well-heeled men and women. In addition to 241 guest rooms, the biggest draws are its dining and drinking establishments that attract locals as well as tourists such Milk Room, an eight-seat microbar offering pastries and coffee during the day and high-concept cocktails by night; Game Room, which houses two bocce courts, pool tables and table games; and Cherry Circle Room, an all-day restaurant that's cocktail-focused. Four Seasons Chicago: Those looking for a luxury experience with family should check into this top Magnificent Mile gem. The kids—whether they're toddlers, tykes or teenagers—should enjoy a number of premium perks; everyone loves the Ice Cream Man, who rolls into each room with a cart full of goodies for the entire family to create custom-made sundaes. The Gwen: Also located right off the Mag Mile, the stylish Gwen hotel is tucked inside the massive Shops at North Bridge, which boasts the likes of Nordstrom, BOSS Hugo Boss, and Louis Vuitton. There are also a number of restaurants within the structure of the hotel, so guests never have to leave the building if it's excessively cold. House 5863 Chicago Bed and Breakfast: This modern-style B&B is on a quiet street directly off the bustling Clark Street action in Andersonville. There are five rooms from which to choose, and there is a cleaning lady who cleans daily. A fully-equipped kitchen offers continental style breakfast with all the basics to allow guests to serve themselves on their own schedules; in addition to complimentary breakfast and snacks, there is free wifi. Raffaello Hotel: This vintage Streeterville hotel underwent a multi-million dollar renovation of its 175 guest rooms and suites recently and has managed to maintain its vintage charm, making it highly sought after for leisure and business travelers. After business there's pleasure, and Drumbar looks and feels like the type of place that would have gotten plenty of Don Draper action back in the 1960s. It’s located on the 18th floor of the hotel and features a fireplace and craft cocktails.